They may look harmless, but - no joke - you're looking at: Turkey and Gravy soda, Sweet Potato Soda, Dinner Roll Soda, Pea Soda, Antacid Flavored Soda! All sodas are completely vegetarian, certified kosher, and contain zero caffeine, calories, and carbs. 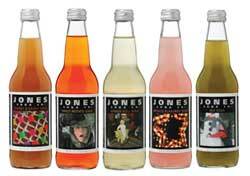 Incredible... they do seem a bit crazy at Jones Soda. "Turkey & Gravy not interesting enough for you? Think you can do better? Fine then, visit our suggest a flavor page, and give us your two cents." What could be stranger than vegetarian Turkey soda? Content updated 10 March 2019. <URL: http://boralv.se/blog/?id=1164652704>. This server is able to calculate 27.2 pages like this per second. No computers were harmed in the making of this page. CSS Validator, HTML Validator.